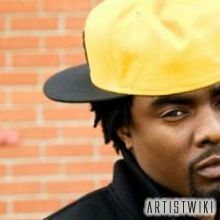 Olubowale Victor Akintimehin (born September 24 1984 in Washington, D.C.), better known by his stage name Wale, is an American rapper and producer. Fusing DC’s homegrown go-go genre with a streetwise Northern hip-hop sensibility, he takes samples from all genres and blends them together with lyrical dexterity. In 2005 he released his debut mixtape, Paint a Picture, and has since released four more. His debut album, Attention Deficit, was released November 10, 2009.